2013 Previews. NL Central: Maybe You Can Be Weak Up The Middle? Chicago: The cupboard is not as bare here as widely believed – but it’s close. Firstly, the Cubs have two of the game’s emerging stars in first baseman Anthony Rizzo and shortstop Starlin Castro (when he’s watching the game he’s in). There is also an able and patient management structure, from field boss Dale Sveum through president Theo Epstein. Behind them are three of the higher-potential impact position prospects in infielders Javier Baez and Junior Lake, and outfielder Jorge Soler. The problem is, the next most interesting thing about the Cubs is the debate over whether they should commemorate the centennial of Wrigley Field next year (to note 100 years since it was built, as Weeghman Park, for the Chicago Whales of the long-gone Federal League) or in 2016 (to note 100 years since Weeghman bought the Cubs and moved them to his stadium). Because possibly for the next four seasons, Rizzo and Castro and the When’s-The-Centennial question might be the only things to talk about at 1060 West Addison Street. Cubs fans have to hope Rizzo and Castro are still there by the time Baez and Soler (and to a lesser degree, Lake) get there. And they have to hope that some pitching finds its way there, too. Because right now there’s none, other than the intriguing Japanese reliever Kyuji Fujikawa and his counterpart among domestic spelling confusion, Jeff Samardzija. Cincinnati: Lost in the debate that lingered through nearly the length of this lengthiest spring training – does Aroldis Chapman close, or get moved to the rotation – was the fact that on September 7, 2012 Chapman imploded. He faced seven Astros in the ninth, struck only one of them, gave up four hits (including a three-run homer to Matt Dominguez), and blew a 3-2 Reds’ lead. Three days later he walked three of the five Pirates he faced. Dusty Baker then gave him 12 days off, and although Chapman recorded saves in his last three appearances, he was no longer the untouchable pitcher of the season’s first five months (4 innings, 3 K’s, 3 BB, 1 hit). He then nearly coughed up Game 1 of the NLDS against the Giants (5-1 lead: two walks, two wild pitches, a hit) while following up with clean but irrelevant innings in the losses in Games 3 and 5. My point is that, as often happens, debate obscures trouble. Any weaknesses Chapman showed in Arizona this spring (5 strikeouts, 4 walks, in nine innings – an opponents’ batting average of .294) could be attributed to the aborted starting experiment rather than something like, say, a pre-critical-mass arm problem. That Cincinnati has at least one viable alternative in the pen (Jonathan Broxton was lights out this spring) is not the point. Chapman, as starter or reliever, is the pitching centerpiece of a team in a division where the contenders can all hit, and are separated by their mound strength. If Chapman is not the guy he was most of last year, the Reds are down one asset. As it is now, his failure to convert to the rotation means Cincinnati can’t survive any more of the past yo-yo seasons from the likes of Mike Leake and Homer Bailey. If something serious happens to Chapman, Broxton will adequately replace him – but the bullpen depth, which already hits Manny Parra levels surprisingly early, will be taxed. Obviously the Reds are improved offensively. Shin-Soo Choo is one of the game’s underrated outfielders (career OPS: .847. Matt Kemp’s career OPS? .853 ) and provided his back woes of the last two weeks are transient, will handle both the leadoff spot and centerfield with ease. That’ll give Billy Hamilton a year to learn to play the position in the minors and become a Vince Coleman-like figure in Cincinnati (without so much of the throwing-firecrackers-at-fans part). But as Chapman goes, so go the Reds. Milwaukee: That the Brewers think Corey Hart will be back far earlier than the original July/August timeframe is indicated by their willingness to stick Alex Gonzalez at first base – rather than a prospect like Hunter Morris or a retread veteran – in his absence. With Hart’s bat, the Brewers’ new formula – in which at least four of the guys (Aoki, Gomez, Segura, Weeks) are as much about getting on as getting over – can churn out runs. Without him there’s a dead spot in the middle of the lineup and suddenly Ron Roenicke is depending on catcher Jonathan Lucroy to drive in 90 runs. The Brewers’ starting pitching may have been better than thought even before they ransomed Kyle Lohse from The Island Of Misfit Scott Boras Clients. Yovanni Gallardo is a stud and Wily Peralta will eventually be one, leaving quality needed from only two of the group consisting of Marco Estrada, Mike Fiers, Chris Narveson, and the AAA rotation. Milwaukee can win this division but all the ifs will have to turn in their favor. Lohse will have to succeed outside of St. Louis, Hart will have to heal quickly and hit hard, and Peralta will have to be ready now. Because the bullpen could be a disaster. John Axford blew 9 of 44 save chances last year, briefly lost his job to a terrified looking Jim Henderson – and there is no depth behind them short of imported lefty specialists Mike Gonzalez and Tom Gorzelanny. Pittsburgh: With a few breaks the Pirates could leap into contention this season, but if the Brewers need all the ifs to run in their favor, Pittsburgh needs that from ifs nobody’s yet envisioned. It speaks to the degree the franchise has shed its farce label that Russell Nathan Coltrane Jeanson Martin chose to sign up rather than stay with the Yankees; it speaks to reality that only after he rallied with a strong September did Russell Nathan Coltrane Jeanson Martin manage to hit .211 last season. There’s always something like that with the Bucs. Here they can go and trade off closer Joel Hanrahan for a hatful of Boston prospects and try to turn ace set-up man Steve Grilli into his successor – yet this also means that they are relying on a 36-year old novice closer, who made his major league debut five weeks into this millennium yet in all that time has had exactly 11 save opportunities (five of them last year – three of which he blew). Andrew McCutchen is a great player and Pedro Alvarez and maybe Starling Marte have the potential to be nearly if not great. Gerrit Cole and Jameson Taillon are living up to the pitching hype. But the Pirates can find a cloud for any silver lining. The same people who chose and developed all five of those men (and Neil Walker too) gave pitching prospect an over-slot bonus of $2,250,000 three drafts ago. Last year they had to convert him to being a first baseman. He hit .213 – as a 21-year old facing 18-year olds in rookie ball. That a draft choice named Stetson might prove to be all hat and no cattle as pitcher and hitter would just about sum up the Pirates. St. Louis: You know what would be really cool? If Jon Jay could play shortstop and Oscar Taveras could play second base. Over the last few years the Cardinals have developed a reputation as the Drs. Frankenstein of the middle infield. They’ve tried to make Allen Craig, Skip Schumaker, and now Matt Carpenter into second basemen, each with ineffective if not entirely unhappy results. Now would be the time for one of their creations to rise from the operating table, because the middle infield is the only hole in an otherwise dominant ball club – but what a hole it is. Carpenter showed some usefulness filling in at first and third last year (and he’s due back to fill in for David Freese at third as the season starts), but there’s no sign he’s a second baseman. And Pete Kozma’s credentials as a defender at short are passable, but the hitting he did down the stretch and in the playoffs last September and October is just about all anybody should expect. The Freese injury may be the happiest of accidents, shuffling Carpenter off second and forcing the definitionally adequate Daniel Descalso into the lineup at second TFN. Otherwise the Cards are just great. Won’t miss Chris Carpenter or Kyle Lohse. Still producing kid pitchers in clusters (this year’s – after previews last year – Shelby Miller, Trevor Rosenthal, and Joe Kelly), still two or three deep at the back end of the bullpen (Motte’s hurt? Get Boggs and Salas ready). The aforementioned Taveras could step in if (when) Matt Holliday and Carlos Beltran get hurt. Yadier Molina is as good as they get. So – how much does an offensive hole at short and a defensive hole at second hurt an otherwise impeccably built team? We’ll see. I think the Cardinals can get through the division. After that? Notice what happened to the Tigers when they tried to sneak poor execution past the Giants. I’ll take the Cardinals in a tight race over the Reds with the Brewers finishing third – and I’m not sure if they’re a factor or not (ask Corey Hart). Pittsburgh’s fourth (maybe challenging for third). The Cubs will finish last. But one passing thought: what if the Rangers, who have too many middle infielders but not enough outfielders and actually sent Jurickson Profar down, and the Cardinals, who have too few middle infielders but too many outfielders and actually just sent Oscar Taveras down, had the collective cajones to swap Taveras straight up for Profar? I have a few more things gleaned among the cacti to report (besides the fact that Billy Hamilton is the fastest ballplayer I’ve ever seen, and seems to be going faster than freeway traffic). No, this is not the world’s oldest, saddest boy band. Nor, despite the angles, are Manager Terry Francona of the Indians and President Theo Epstein of the Cubs actually resting their heads on my shoulder (they’d join me in saying ‘thank goodness’). I was privy to witness the reunion of the Men Who Made The Red Sox Great at HoHoKam Park, two weeks ago tomorrow. 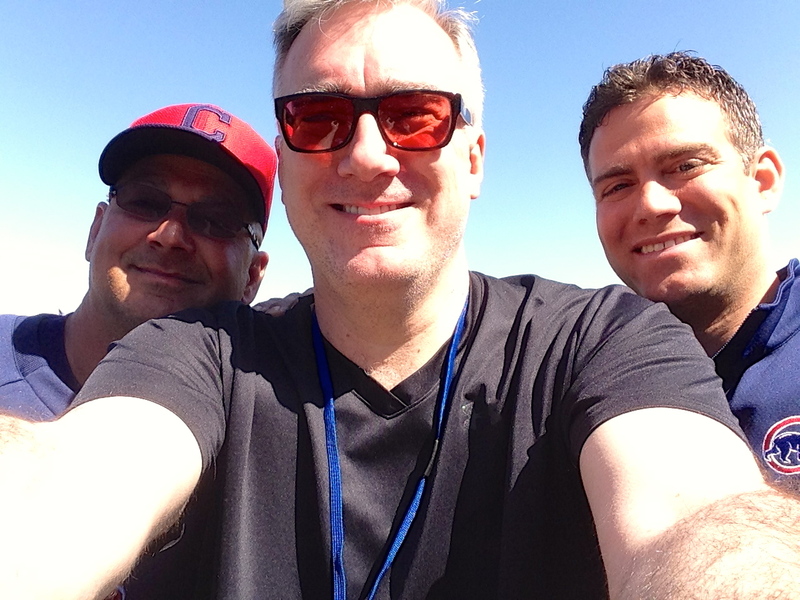 They’re both among my baseball friends and typically we spent almost no time talking baseball. Also got to see Billy Williams, Dale Sveum, and Brad Mills that day, too (“Nice to see you back with a Major League Team,” I said to Millsy. He smiled and was respectful enough to say nothing, but he looked 10 years younger – as did Tito). This is not Jackson Browne, though I’ve seen them both in the last 18 months and if the gentleman spotted at Peoria during a Brewers-Mariners game dyed his hair, they’d look like brothers. That’s Ted Simmons, now an advisor in the Seattle front office, and simply put one of the smartest men in the sport. When Pirates fans harken back to the last winning Pittsburgh team they invoke the names of Jim Leyland and Barry Bonds (and occasionally even Stan Belinda), they don’t mention the last winning GM: Ted Simmons. He was just getting into the rebuilding of the post-Bonds Pirates when he suffered a heart attack during the 1993 season and retired. He’s been a coach and executive since – and that was after his 46.5 WAR (greater than Hall of Famers with careers of similar length like Nellie Fox, Kiki Cuyler, Orlando Cepeda, Ernie Lombardi, and the just-elected Deacon White). 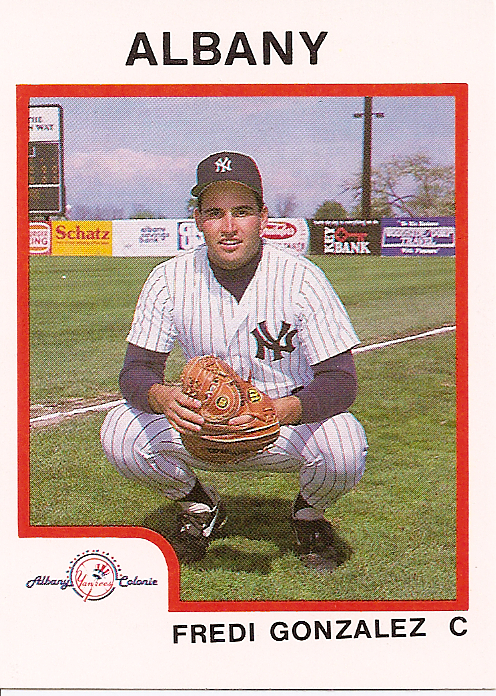 Narrow that down to catchers (Bill Dickey 52.5, Gabby Hartnett 50.7, Simmons 46.5, White 44, Lombardi 43.6 – and you occasionally hear Jorge Posada’s name mentioned at 39) and it’s obvious that “Simba” is a Hall of Famer. Despite a career line of .285/.348/.437 and seven .300 seasons, his work was overshadowed by being Johnny Bench’s exact contemporary for 15 years, and then spending nearly all of his last five at DH or 1B. 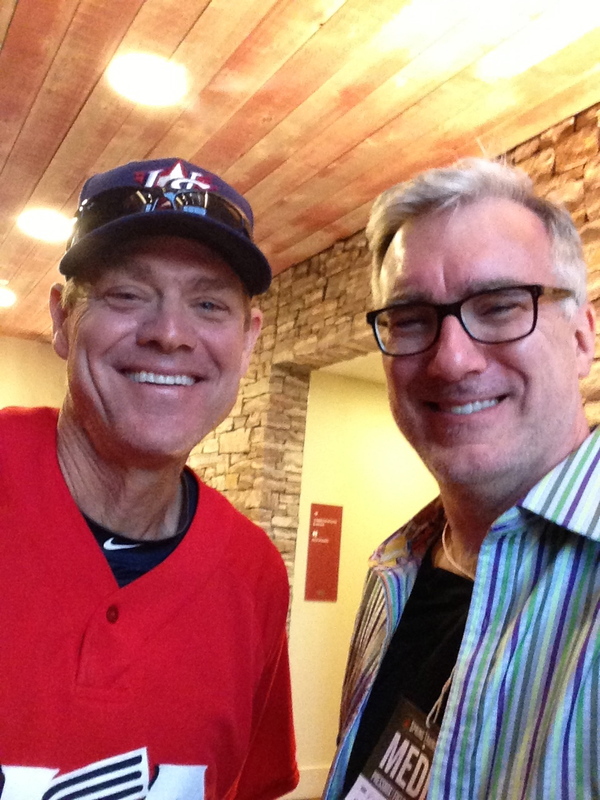 Dale Murphy returned to the game last season in the Braves’ tv booth, and returned to uniform this spring as the first base coach for the USA team in the WBC. 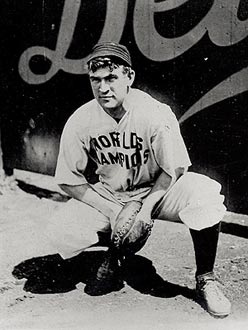 One of the older arguments for the Hall was the “wozzy” test – “was he considered for any length of a time one of the top five players in the game?” After two MVPs and a decade as one of the most feared hitters/least feared people in the game, Murph kinda flatlined starting with his 13th season in the majors. But again, WAR puts him in historical context. Lou Brock’s a 42.8, Jim Rice a 44.3, Chuck Klein a 41.5. Murphy: 42.6 – and in this time when one element in the Cooperstown ballot has suddenly taken on added importance (“character”), his was and is impeccable – and generous. Here’s another one of my favorite baseball people. 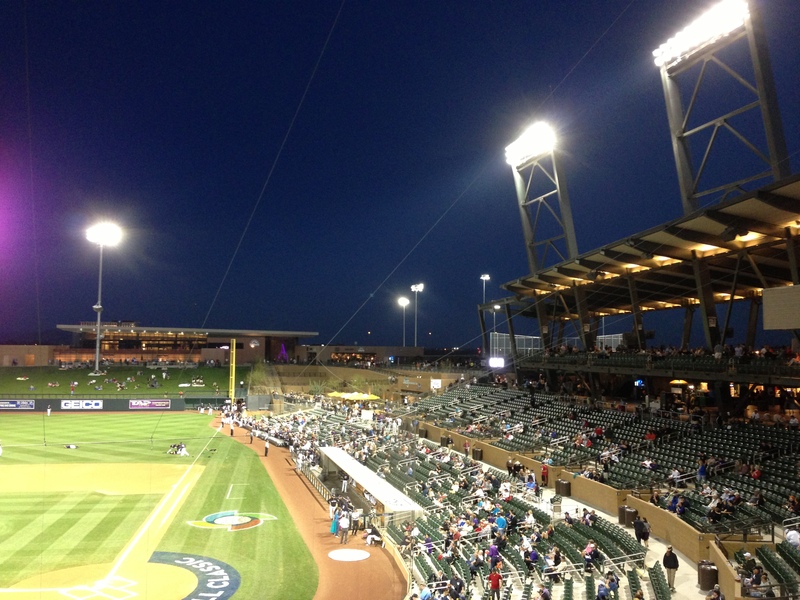 This one unexpectedly showed up with the visiting Royals on a frigid night at the Rockies’ facility, Salt River Fields. 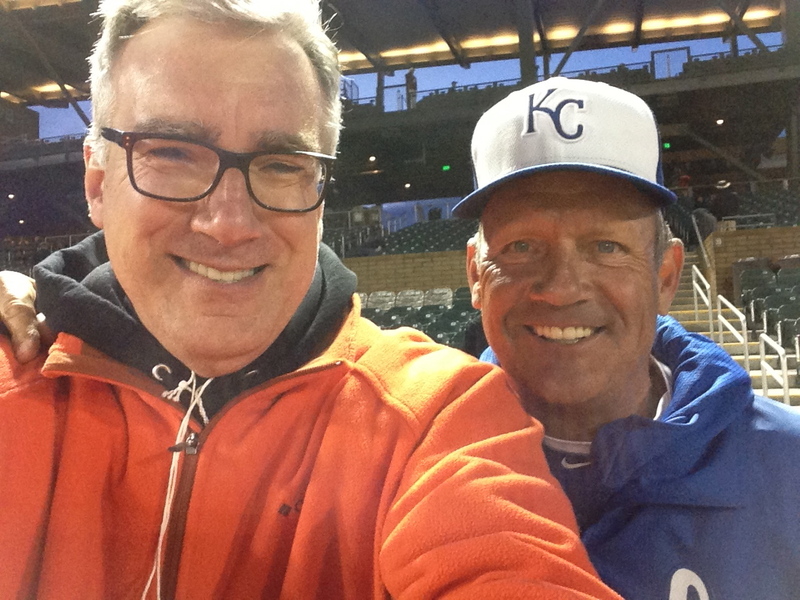 When I tweeted this photo I believe I said that I first interviewed George Brett in 1980. In fact, that was when we were first “introduced.” I actually interviewed him in 1976, 1977, and 1978 during the A.L. Playoffs – the “nice to meet yous” came during the 1980 World Series during a memorable and scatological interview about the hemorrhoids that plagued him during the post-season. This might have been the same day I met a mid-level Royals’ executive named Rush Limbaugh (how would you ever forget a name like that). 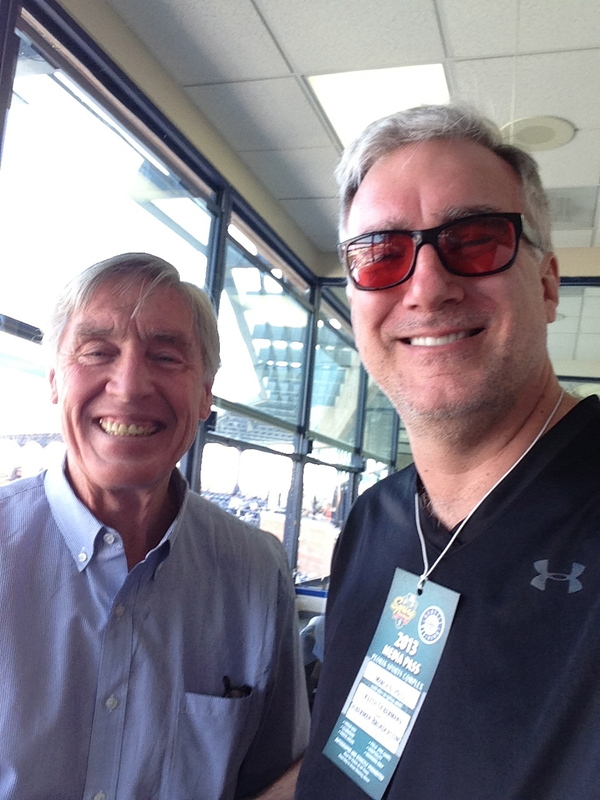 He and Brett remain best friends, and George and I laughed our way through 15 minutes in the KC dugout, which no matter how you diagram it means baseball trumps politics every time. George remembered that ’80 interview of course, but also (to my surprise) recalled that I got to interview him – for Fox – after his election to Cooperstown in ’99. This, of course, is Wash.
All the other guys on the photo tour are Hall of Famers, or should be, or might very will be (Terry Francona needs one more measurable success in his managerial career to cinch a spot – and he’s only 54 – while if Theo Epstein also turns the Cubs around, he’s a lock). 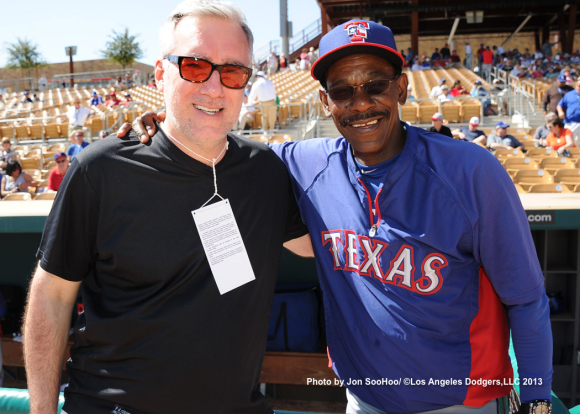 The first person to tell you he’s not getting to Cooperstown – surely not as a player – is the ever-affable skipper of the Rangers, Ron (.261/.292/.368, ten years, one as a starting player) Washington. But few figures in the sport are greeted with greater affection, by his players and rivals alike. Just to amp this shot up a little bit, check out the copyright. That’s Jon SooHoo, who I’ve known ever since I was a local sportscaster in LA and who has shot 30 years of incredible images on behalf of the Dodgers. There were many other men I’m proud to call friends who I didn’t trouble for photos: Vin Scully, Bob Uecker, Bruce Bochy, Bob Melvin – the average was about three a day, and it emphasized that while we get swamped by scandal and controversy and stats and new-age stats and boasting and showboating, the game is about good people whom you get to know and cheer for, for a very long time. 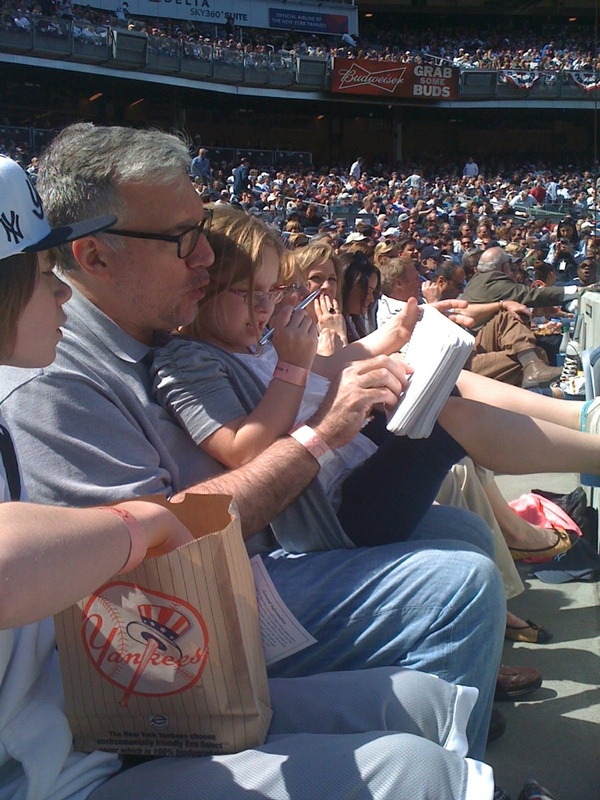 F irst of all, this photo of my six-year old niece helping me keep score at the Yankees’ opener doesn’t have a thing to do with the NL Central. It’s just that it represents her first tentative steps towards fandom, and is to my mind fully representative of the rituals of the sport. Just the other day she ceaselessly quizzed her ball-playing older brother about what all the players do. Now she’s trying to figure out what the hieroglyphics represent, and carefully entering abbreviations at my instruction, and asking with delighted amazement: “What does that mean?” (She also insisted we take a walk, I told her we’d go wherever she wanted in the park because she was in charge. “Yes,” she said matter-of-factly. “I know”). The history of winning the World Series and then altering your uniform the next year to advertise the fact is a star-crossed one. The 2009 Phillies, 2007 Cardinals, and 2005 Red Sox all dipped their toe into the pool and wore special gold trim on their unis for their first one or two home games. The 2011 Giants wore a particularly garish patch all season long. Not one of them repeated their previous year’s triumphs. Go back into history and there are greater calamities still: the 1920 Cleveland Indians overcame the mid-season death of their star infielder Ray Chapman after he was hit in the head by a Carl Mays pitch, then surged past the scandal-ravaged White Sox to grab their first pennant, then won the World Series in large part because of an unassisted triple play by Chapman’s double-play partner Bill Wambsganss. Next year, Wamby and his teammates dressed in these uniforms: The “Worlds Champions” finished second in 1921, did not seriously contend for the pennant again until 1940 (when they were decimated by an internal player revolt against their manager, earning the players the nicknames “The Crybabies”), didn’t win another Series until 1948, and haven’t won one since. The 1927 Cardinals did something similar, although a little less garish, were punished by being crushed in the ’28 Series by the Yankees and the ’30 A’s, but were winners again by 1931. The 1906 New York Giants wore these modest little outfits, at home and abroad, to celebrate their 1905 title. The Giants fell out of contention in ’06 and ’07, suffered the singular ignominy of the 1908 pennant race and the Merkle Game Controversy in ’08, watched the president of the National League kill himself over that controversy in ’09, didn’t compete in ’10, had their ballpark burn down in ’11, lost the epic series on the Fred Snodgrass “muff” and the Mathewson Wrong Call in ’12, lost another Series in ’13, watched one of their cast-off pitchers lead the last place team past them and to the Series title in ’14, saw the team break up amid gambling rumors in ’15, won 26 in a row and still finished only fourth in ’16, lost the ’17 Series when nobody covered the plate on a rundown from third base, and didn’t come out of it until they won the Series of 1921 and 1922. I’m not suggesting wearing a uniform devoted more to bragging than team identification caused these calamities, but there is a remarkable amount of trouble associated with teams that merely tinkered with their jerseys after they prevailed. The Cubs went from wearing a simple “C” for their 1907 shirt to a “C” with the “Cubby Bear” nestled inside in 1908. They repeated the title that year, but changed the jerseys to an even more ornate version with “Chicago” spelled vertically down the buttons in ’09, and you might recall what ’09 was the start of for the Cubs. 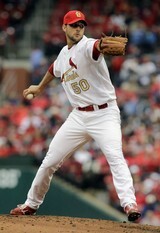 This is a very very very long way of leading up to this question: This gold-lettered uniform the Cardinals wore Friday? Why did they wear it? I mean, none of the teams in the National League Central are among baseball’s best this season. They just aren’t and more over, they know it. The division has been drained by the departures of Albert Pujols and Prince Fielder, and despite producing two playoff teams, a World Champion, and a (brief) Cinderella Team, it wasn’t a very good division last year, either. I’m saying the title might come down to superstition. So why tempt it? I mean, the caps are a little kitschy but the unis are kinda nice. But did you notice that after wearing it for one day, David Freese is already hurt again? ST. LOUIS has to be the default favorite, but Carpenter’s gone, Wainwright has looked like crap, Berkman’s already suffered two minor injuries that could linger and limit him, or explode and finish him. Among all humans who’ve never managed before, Mike Matheny is probably the 2nd best choice to try to start on the big league stage (Robin Ventura is the 1st), but on what experience will he call if the injuries continue, or the bullpen falters, or Carlos Beltran is sidelined by a scratched nostril,or the Cards all get blood poisoning from the jinxed gold-flecked unis? Conversely, managerial experience is no automatic indicator of success – ask CINCINNATI. We all love Dusty Baker, one of the great human beings, but his reluctance to trust youngsters has imperiled the career of Aroldis Chapman and is now reflected in his insistence on catching Ryan Hanigan more than Devin Mesoraco. The Ryan Madson injury will only make Dusty even less willing to trust anybody under 35, and I just have to wonder if at some point ownership is going to wake up in the middle of the night and say “we have committed 297 and a half million dollars to the least important quadrant, the right side of the infield” and disappear into the Arctic or something. How on earth is a market like Cincinnati supposed to produce such revenues? Is the news about the Minnesota Twins censored on the internet in the southern half of Ohio? More immediately, there’s a serious question about every Red pitcher (except Chapman, and of course he is used only as the 6th or 7th most important man on the staff). The Conventional Wisdom suggests Aramis Ramirez was brought to MILWAUKEE to partially offset the loss of Prince Fielder. Nuh-uh. He was brought in to offset the disappearance of Casey McGehee. The Brewers’ swaggering line-up of 2011 looks awfully human with Gamel and Gonzalez and Ramirez in it in 2012. Randy Wolf looks like he’s at the end of the line and the internal dissatisfaction with Zack Greinke is astounding. It’s a very good bullpen, but in any other division this would not be a serious contender. If Jeff Samardzija and either Bryan LaHair or Anthony Rizzo are for real, CHICAGO may be better than expected, but not much. LaHair has hit well in the NL and Rizzo in the PCL and the obvious move would be to stick LaHair in the outfield, which is already a defensive wasteland, call up Rizzo, and let ‘er rip. Or better yet, off-load David DeJesus or Soriano or Byrd for whatever you could get for them, and give Brett Jackson a shot out there, too. But even if the Cubs hit, past Garza and maybe Samardzija the rest of the rotation is dubious and the bullpen (with the possible exception of rookie Rafael Dolis) will give away a lot of games. There is a narrow pinhead through which PITTSBURGH might squeeze, and force their way into contention. Revivals from Erik Bedard and A.J. Burnett would give a good bullpen something to save. Andrew McCutchen might blossom into an MVP candidate. Starling Marte might come up next month and hit .330. But masked by the completeness of the Buccos’ post-play-at-the-plate collapse last year was what happened to the fuel of their brief spring in the sun. Jose Tabata vanished. Garrett Jones vanished. Kevin Correia vanished. Jeff Karstens vanished. Inexplicably, Pedro Alvarez vanished and the Pirates insist on still playing him. Midnight struck and Clint Hurdle was suddenly managing a pumpkin farm. Everything that went right last year has to go right again this year – and then some. There is one bright spot in HOUSTON. If the new owner and Poor Brad Mills (the manager’s new first name) had had to have taken this team into the American League this year, the Astros might’ve gone 30-132. There may be sparkles from Jason Castro behind the plate, Jose Altuve at second, and Brian Bogusevic, J.D. Martinez, and Jordan Schafer in the outfield, but it is plausible that beyond Carlos Lee there might be nobody on this team who hits 15 homers. There certainly aren’t going to be any starting pitchers who win 15 games. Good lord, as I read this to myself, it dawns on me: all the starting pitchers might not win 35 games among them. Man, I have no idea. If these teams were scattered among the other divisions there wouldn’t be a lead-pipe-cinch pennant contender among the six of them. I guess St. Louis will win, with Cincinnati and Milwaukee behind them, and Chicago and Pittsburgh arguing over fourth, and the Astros disappearing from National League history like the Cheshire Cat. The pennant race might prove variable and exciting, but it will not be good, and it will make fans in places like Toronto and Seattle and Miami wish that realignment were a reality. NL Central 2012: Ryne Sandberg Versus The Cubs? Fascinating that the St. Louis Cardinals have asked the Phillies for permission to interview their AAA manager Ryne Sandberg – and received it. For the second consecutive year, Sandberg will not get the managing job with the team for which he starred. When new Cubs’ President Theo Epstein outlined his minimum standards for the next manager (experience as a major league skipper or coach) it essentially eliminated Ryno from consideration because his stints with the Phils last spring and last September do not formally rise to that level. Yet oddly, the Cardinals are happy to at least kick the Sandberg tires. I’m not sure what it proves, but it would seem to suggest that the division of thought on Sandberg’s managerial potential may now split into those who have seen him, the Hall of Famer, willing to ride the buses of the Midwest League, and those who have actually employed him to manage their bush leaguers. Everything I heard as of March, 2010, was that the Wrigley Field job was likely to be Sandberg’s whenever Lou Piniella left. But by August, when Piniella really did leave, the Cubs had soured on Sandberg and no longer thought him viable. Off he went to the Phillies, and now they are willing to let him talk to a National League rival, and there hasn’t been a peep about Sandberg even getting a promotion to the Phillies’ major league coaching staff. Even stranger, is that before he took the Phils’ offer last winter, Sandberg interviewed for the equivalent job in the Boston system – with Theo Epstein, the same man who’s ruled him out in Chicago. I’m reminded of Babe Ruth’s quixotic hope that the Yankees would make him their manager (they’d seen him do that with his teammate, Bob Shawkey, who had only one season managing in the minors before he got the job in New York in 1930). Perhaps the more apt comparison is Gary Carter’s campaign to get the Mets to consider him for any of their last few managerial openings. If Sandberg doesn’t get the St. Louis job, the Cubs-Cards rivalry might still be ratcheted up by the inclusion of Terry Francona in the mix. While Epstein has said a few polite things about possible Chicago interest in Tito, the Cardinals are scheduled to interview him tomorrow. I still think St. Louis is leaning towards LaRussa’s third base coach Jose Oquendo (although I would have considered it more than “leaning” if they had brought Oquendo back into the dugout as bench coach), but it would be a fascinating dynamic if Francona got the Cardinal job and was pitted against his old cohort Epstein in Chicago. Besides the headline names, the Cards and/or Cubs seem interested in a lot of the same men the Red Sox are interested in: Rangers’ pitching coach Mike Maddux, former Brewers’ interim skipper Dale Sveum, and Phils’ bench coach and ex-Reds and Pirates’ interim manager Pete Mackanin. If you want to follow all this on a day-to-day or even hour-to-hour basis, your best resource is the terrific MLBTradeRumors.Com site, which is a clearinghouse for every local newspaper story, every significant radio interview, and every last damn tweet on anything moving in the majors. It puts the ESPN’s and SI’s sites to shame. So stay tuned to the prospect of Sandberg or Francona in St. Louis, and if you’re a Cub fan again tearing out your hair about Ryno, consider this Cooperstown fact. 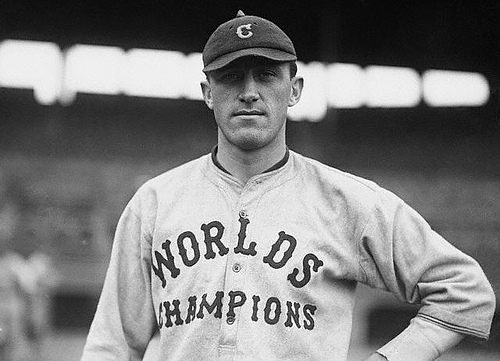 These are the Hall of Fame players who, since 1900, went on to manage “their” team: Honus Wagner (Pirates), Ty Cobb (Tigers), Walter Johnson (Senators), Tris Speaker (Indians), Nap Lajoie (Indians), Eddie Collins (White Sox), George Sisler (Browns), Rogers Hornsby (Cards and Cubs), Fred Clarke (Pirates), Jimmy Collins (Red Sox), Frank Chance (Cubs), Johnny Evers (Cubs), Joe Tinker (Cubs), Frank Frisch (Cardinals), Pie Traynor (Pirates), Mel Ott (Giants), Bill Terry (Giants), Gabby Hartnett (Cubs), Ted Lyons (White Sox), Joe Cronin (Senators and Red Sox), Lou Boudreau (Indians), Dave Bancroft (Braves), Yogi Berra (Yankees), Eddie Mathews (Braves), Red Schoendienst (Cardinals), and Tony Perez (Reds). That’s 26 guys, who managed a lot of years, yet won only 18 pennants among them — and 13 of the 18 were as player-managers and four of those were by Frank Chance. In other words, of the other 25 hometown heroes who later managed, they could collectively amass only five pennants as non-playing skippers. It is a little unnerving to consider a baseball world without Lou Piniella – he’s been part of the major leagues, either as prominent prospect, trade chip, rookie of the year, grizzled veteran, coach manager, general manager, or broadcaster, almost continually since he didn’t make the Washington Senators out of spring training in 1964. Besides the obvious about Lou, you should consider that he was traded four times before he got his first major league hit, had the principles to honor a symbolic work stoppage in 1969 even though he had only ten big league games under his belt, was perhaps the most notorious arguer among the active players of his time, and managed to have a knock-down, drag-out fight with his ace reliever (Rob Dibble) while at least one tv news camera captured it, in the Cincinnati clubhouse. 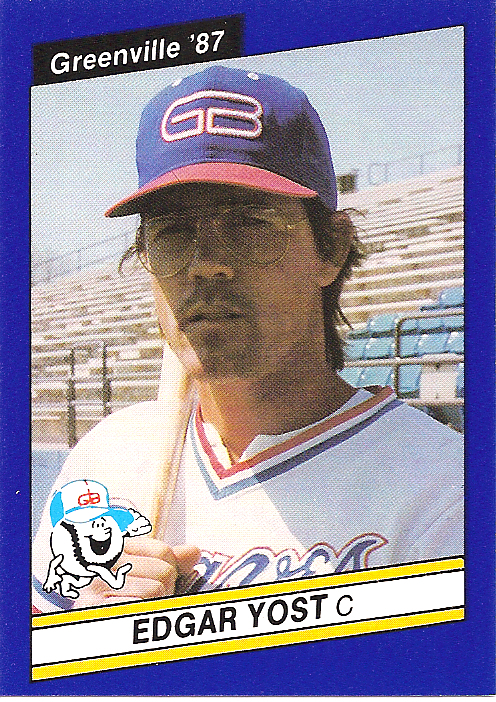 I think Piniella would have happily managed until he was 80 if he had a bunch of guys like Dibble – nuts as he was – who cared enough to take a swing at him. There is a certain irony to the mindset that his retirement today in Chicago was just the capper to a season that saw Carlos Zambrano detonate, again. I got the impression that Zambrano was the least of Lou’s problems, and that Piniella had a lot to do with the attempts to resuscitate Zambrano’s status with the Cubs. It was all the other guys with whom he’d had it. It’ll be Ryne Sandberg. The new ownership can’t resist, and nobody can argue Sandberg would be getting the job just for his name. He’s worked his way from the bottom up in the Cubs’ system, a rare thing for a Hall of Famer to do. There has been a lot of new information about 2010 job vacancies flying around baseball’s seamy underbelly of rumor. I have now heard “Joe Torre, Mets” and “Ted Simmons, Mariners,” several times each, and the two old St. Louis teammates would be superb choices. In New York, where Jerry Manuel has done the best he could, the Torre situation is intriguing and disturbing. The club has financially hamstrung its executives ever since ownership got leveled in the Madoff scandal, so it’s hard to believe they could pay anything approaching the five million dollars Torre’ss getting from the Dodgers these days, unless Oliver Perez retires to a monastery. As to Simmons, he’s the should-be-Hall-of-Fame catcher from the Cardinals and Brewers, and it is forgotten now because he had to leave the position so prematurely because of health issues, but he was one of the up-and-coming General Managers, in Pittsburgh in the early ’90s. More lately he’s been a valued bench coach at Milwaukee and San Diego and would, at the age of 62, be an unlikely, but inspired choice as a rookie manager next year. We go back to this well – or perhaps it’s better described as “this bottomless pit” – of the prominent baseball figures of today, as they appeared on minor league baseball cards as recently as 1990 and as long ago as 1975. In this edition, three of the 2010 managerial changes are fully represented in the bush league cards of 1987 and 1990. Most of what we’ll see is from the panoramic, 2,000+ card set issued, one team at a time, by the ProCards company. 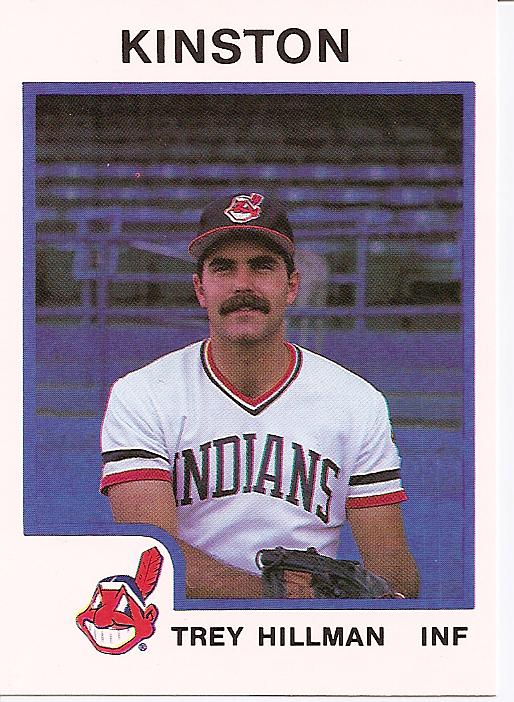 The former manager of the Royals, then a prospect in A-ball for the Indians, no longer has the job but still has the mustache. The new manager of the Royals (right), no longer has the mustache, but has long since stopped having to deal with his given name and goes exclusively by Ned. He, of course, had already been a major league receiver for the Brewers and Braves and would shortly begin his coaching and skippering career. 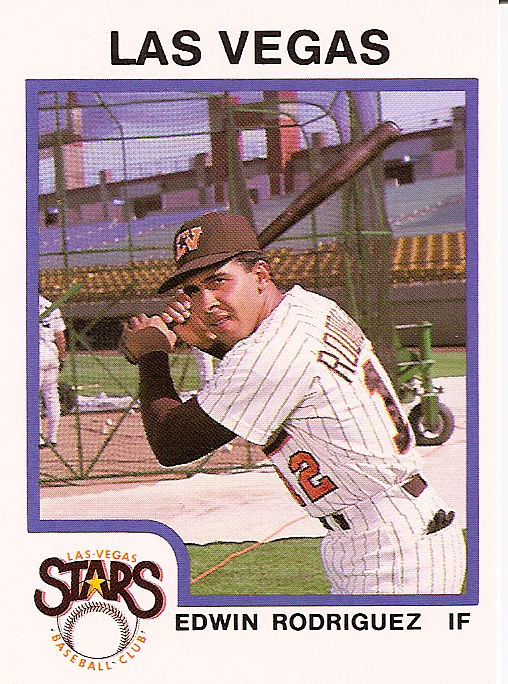 Fredi Gonzalez was in AA-ball in the Yankee system in 1987 and Edwin Rodriguez a notch further up in the Padres’ chain, long before one left the Florida dugout and the other entered it earlier this year. Have to say the years have treated them both pretty well. Rodriguez looks a little like the current president in the Las Vegas pose. One side note here. In going through prospects to replace the current big league managers, I suggested that the Marlins might off Fredi and he would thus move to the top of the possibilities to succeed Bob Cox in Atlanta. 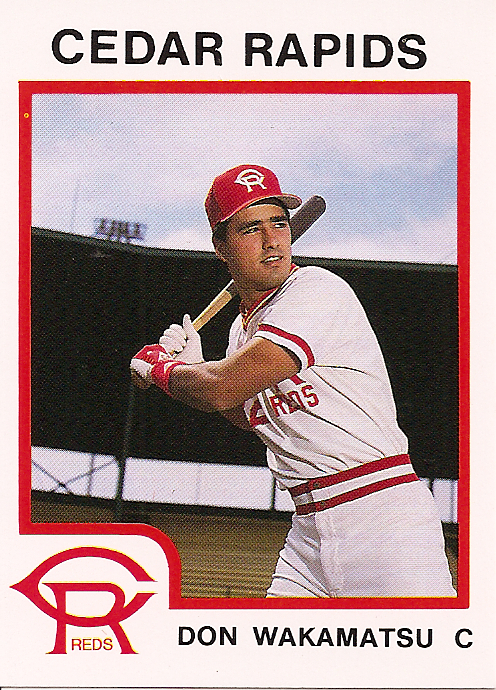 I’m pretty sure it’s the angle of the photography at Cedar Rapids of the Midwest League in 1987 that makes it look like ex-Mariners’ manager Don Wakamatsu is trying to hit with a souvenir bat. 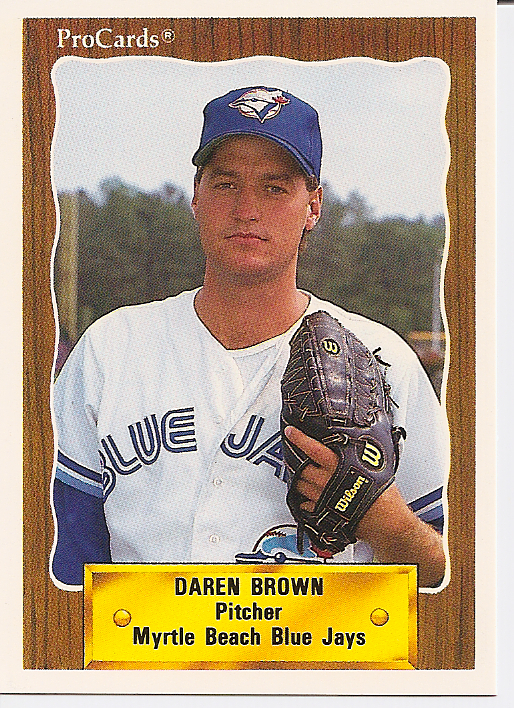 Interestingly, his successor, Daren Brown, already had something of a manager’s stare-down in just his second season as a pro, at Myrtle Beach, South Carolina in 1990. We have plenty more of these to go through, everything from GM’s to ex-GM’s to popular announcers, to superstars and possible Hall of Famers. I can be bribed into not sharing them, by the parties depicted, and you birds know who you are. I guess you mention this now to decrease your client’s trade value, so maybe the best option for his current team winds up being letting him walk as a free agent. They take the draft choice; you take the percentage of whatever the market can bear. Otherwise there can’t be anything logical about the agent for Adrian Gonzalez explaining he is expecting a Mark Teixeira deal, from the Padres, or from which ever the Padres deal Gonzalez to, or from the free agent market in the winter of 2011-12. The Padres are not going to summon $180,000,000 even to keep a popular hometown superstar, and it seems unlikely that many other franchises would. If the Cubs really aren’t looking at Derrek Lee long term (how is my Micah Hoffpauir recommendation working out, by the way? ), the Chicago teams might battle for him, maybe the Mets, but without the Yankees there to help drive the market, the money just isn’t going to be like that for a player who is not Teixeira’s defensive equal, and it would presumably limit trading interest in a pre-free agent Gonzalez to lesser prospects. Consider what a difference a year – and a conviction by one team that they could sign him, and the conviction by another that they could not – did to Teixeira’s “value.” In 2008 the nonpareil first baseman was a nice rental in Anaheim at a price of Casey Kotchman and Steve Marek. In 2007 Atlanta (in retrospect, disastrously) gave up Neftali Feliz, Elvis Andrus, Matt Harrison, Jarrod Saltalamacchia, and Beau Jones, thinking they were buying Teixeira. If new Padres’ GM Jed Hoyer somehow doesn’t see those stark options, there is the added dimension of Gonzalez’s salary. At just $4.75 million this year, with an option for $5.5 million in 2011, he will be paid for two seasons what Jonathan Papelbon asked for in arbitration for just the one ahead of us. With even the false pretense of a hometown discount erased by the agent’s remarks, there would seem there are three stages to the Padres’ end game with Gonzalez: 1) trade him immediately for a package not unlike what the Braves gave for Teixeira, to a team that believes it can sign him (if you are getting ten years of Gonzalez for the price of eight of Teixeira, the deal suddenly begins to make a little more sense). 2) It is conceivable the personnel price might peak as late as this year’s trade deadline, but certainly beyond it, it will deflate. 3) The last stage is when it just isn’t worth it for anybody to go to the prospect bank to rent Gonzalez for all or part of 2011. Think of it this way. Trade him today and you can have Andrus, Feliz, and Saltalamacchia. Trade him in July and it might just be Andrus and Saltalamacchia. Wait until July 2011 and maybe it’s just Saltalamacchia. I vowed when I started this blog last year to keep politics out of this, so I’ve waited until the news story involving Kentucky Senator/Baseball Hall of Famer Jim Bunning changed from active to past tense tonight, to share an odd bit of research I compiled awhile back. One of the more intriguing measures of a pitcher is his record in the heat of pennant races. Don Drysdale, measured against the Dodgers’ chief rivals in each season of the ’60s, was only about a .500 pitcher. Juan Marichal pitched closer to .600 ball against the key teams in the Giants’ various pennant pursuits. Another measure paints a very odd picture of Bunning the pitcher. He just wasn’t that good down the stretch. Only once in his years with Detroit were the Tigers competitive. On July 15, 1961, they were tied for first with the Maris/Mantle Yankees. From that date on, Bunning posted a record of just 7-5 and his losses were not exactly to the cream of the crop (Baltimore twice, Boston, Chicago, and Minnesota). The Tigers plummeted to second place, eight games out. 1964 can hardly be blamed on Bunning alone, or even to a great degree. But it is still fascinating that however foolhardy Gene Mauch was in running his starters into the ground, the facts were pretty straightforward: On the morning of September 16, Bunning was 17-5 and the Phils were still five games in front. Their ace would make five starts between that day and September 30, and he went 1-4 with a 7.46 ERA. The Phils finished third, though Bunning did win on the last day of the season in a game that could have theoretically forced a playoff. In 1966, the Phils were still on the outskirts of the pennant race on September 5th, seven out. Bunning had a 16-9 record. He dropped five of his remaining eight decisions and the Phils were no factor down the stretch. In the winter of 1967-68, the Pirates stripped their farm system of a couple of top prospects (shortstop Don Money, who made it, and lefty pitcher Bill Laxton, who didn’t) and packaged them with quality lefthander Woody Fryman to pry Bunning from Philadelphia. I can recall vividly that many believed the addition of a pitching ace like Bunning made the Pirates the NL favorites for 1968. He went 4-14. In 1969, the Pirates sold Bunning to the Dodgers in mid-August (and got a couple of fringe prospects to boot) as LA sought to replace the suddenly-retired Drysdale during the frantic five-team NL West title hunt. On August 19, Los Angeles was half a game out. They proceeded to lose six of Bunning’s nine starts (four of the five after September 5, when they were still only a game-and-a-half back). The Dodgers finished fourth, eight out. Again, you can’t pin any of these pennant race collapses entirely on Bunning. In ’64 the Phillies would never have been in the position to fold had he not dominated the league until the middle of September. In ’68 a lot more went wrong with Pittsburgh than just Bunning. And in ’69 he pitched some fine games in LA that the Dodgers could not win for him. But it is odd that not once in four pennant sprints did he finish strongly.